She got engaged to Grammy winning music producer David Foster, 68, after a 14-month romance and 12-year friendship. However, Katharine McPhee opted to sport a 'Dying Alone' long-sleeved shirt during a date night with her fiancé on Friday. The 34-year-old beauty looked in great spirits as she stepped out with her man for dinner at Los Angeles celebrity hotspot, Craigs, in West Hollywood. Katharine paired the white statement shirt that featured an angry looking cat with a grey skirt. The mini skirt had a grid sequin design and drew attention to her long and lean legs. The 2006 American Idol runner-up kept warm with David's suit jacket and finished the look with a pair of heeled pointed-toe ankle boots. Katherine McPhee stepped out in Los Angeles over the weekend with her fiancee in a pair of black ankle boots, a metallic plaid miniskirt and what caught our eye, this "Dying Alone" white sweatshirt. Featuring a cat face, this slogan pokes fun at the notion of being a spinster. We love the humor of it all. 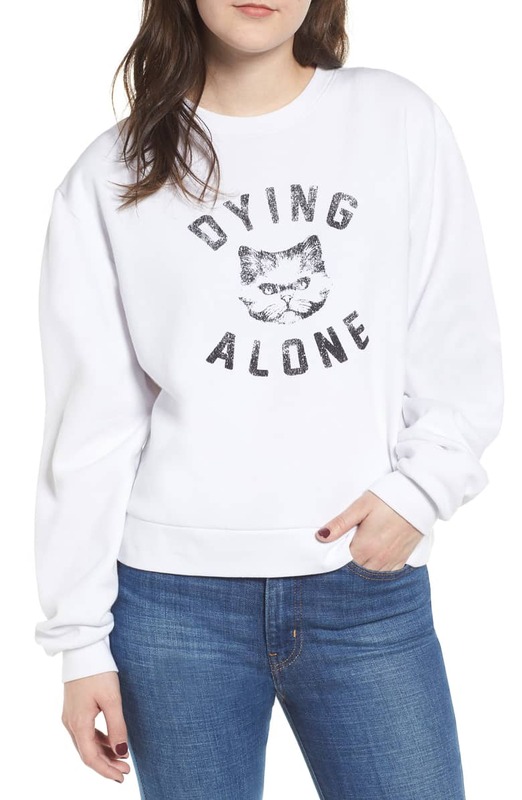 If you're dying for this "Dying Alone" sweatshirt, click right to buy it here now at Nordstrom. And, while you're at it, check out our roundup of slogan white sweatshirts below. Our favorite is "California Love" by Milly. Katharine accessorised her ensemble with a small velour cross-body clutch for the night out. Her brunette locks were styled out and over her shoulders and her glam saw her with a dewy complexion, rosy cheeks and a glossy red lip. David also dressed down for the dinner date in a white shirt and jeans with a suit jacket over the top. The duo got engaged in July 2018 after a 14-month romance and 12-year friendship. 'It doesn't make sense to a lot of people, but it does to us,' the LA native explained to People last month. Katharine divorced 53-year-old Nick Cokas in 2016 after six years of marriage and a highly-publicized affair with her 44-year-old married Smash director Michael Morris. It will be the fifth time down the aisle for David - who was previously married to Yolanda Hadid, Linda Thompson, Rebecca Dyer, and B.J. Cook. He has seven children and one grandchild.